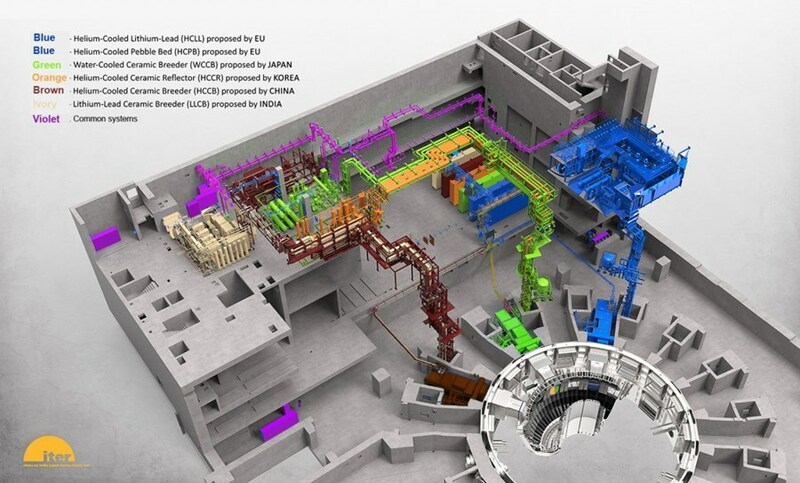 In ITER, six technological solutions for tritium breeding—in the form of test blanket modules plus associated ancillary systems—will be operated and tested for the first time. Their experimental validation will represent a major step for fusion development beyond ITER, when tritium fuel will necessarily have to be bred within the reactor. Located at levels 2 and 4 of the Tritium Building, the ancillary systems for each of the six tritium breeding test blanket modules form a hugely complex network of piping, extraction pumps, heat exchangers, molecular sieves, etc. The test blanket modules themselves are located closest to the plasma. On 22-24 May 2017, the Committee charged with the governance of the Test Blanket Module (TBM) Program convened at ITER Headquarters for its seventeenth meeting. 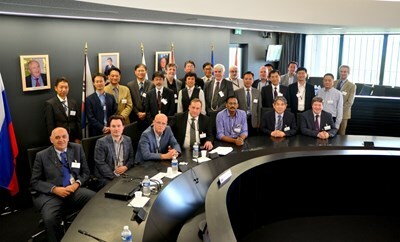 The TBM Program Committee, which advises the ITER Council, meets twice a year to review the various aspects of the ITER TBM Program, for instance the procurement of mockups of tritium breeding blankets and their installation and testing in ITER. The Program Committee noted the good progress for the test blanket systems (TBS) within the ITER Organization and the ITER Members. In particular, conceptual designs have been approved for the helium-cooled lithium-lead and the helium-cooled pebble bed breeder TBSs (both developed in Europe), for the water-cooled ceramic breeder TBS developed in Japan, and for the lithium-lead ceramic breeder TBS developed in India. These latest approvals the represent a major step forward for the TBM Program, marking the end of the conceptual design phase for all systems and components and the beginning of the preliminary design phase. Several hours of the meeting were also dedicated to the report from the ITER Member TBM Leaders on the further development of the TBS subsystem design and analyses, on R&D underway on the question of TBM materials, and on manufacturing aspects including mockup testing. Under collaborative agreements with TBM Leaders, Russia and the US are also contributing significant R&D activities and providing general support to the TBM Program. Experimental work is also progressing on the frame and dummy TBM project—components necessary to hosting the test blanket modules within the vacuum vessel and which are under the responsibility of ITER's Tritium Breeding Blanket Systems Section. The work is performed in collaboration with the ITER vacuum team and aims to validate metallic gasket sealing; for this, a dummy TBM flange applicable to all TBM-sets is in the final stages of fabrication. On 22-24 May 2017, the Committee charged with the governance of the Test Blanket Module (TBM) Program convened at ITER Headquarters for its seventeenth meeting. Tritium self-sufficency is a compulsory element for a demonstration power reactor (DEMO), the next-step after ITER. On the issue of the power supply for the test blanket system helium circulators, the Program Committee noted that potential solutions have been identified. In the present design, the helium circulators are supplied with medium voltage power (MV, 6.6 kV), whereas a recent industrial assessment concluded that only a supply with low voltage (LV, 440 V) is acceptable. The required solution needs to take several constraints into account, in particular the need to respect interfaces that have already been frozen (e.g., with buildings, power supply and cable trays). A final decision is planned in the next few months. As captive components, the connection pipes for the test blanket systems are the only elements within the TBM Program required for installation before First Plasma. For this reason, they are subject to a very tight schedule, with planned distributed deliveries in the 2020-2021 timeframe. The most urgent activity to be performed is the final assessment of tritium permeation from the helium coolant pipes in the vault (including shafts) and vault annex—an issue that will require specific design solutions to manage. 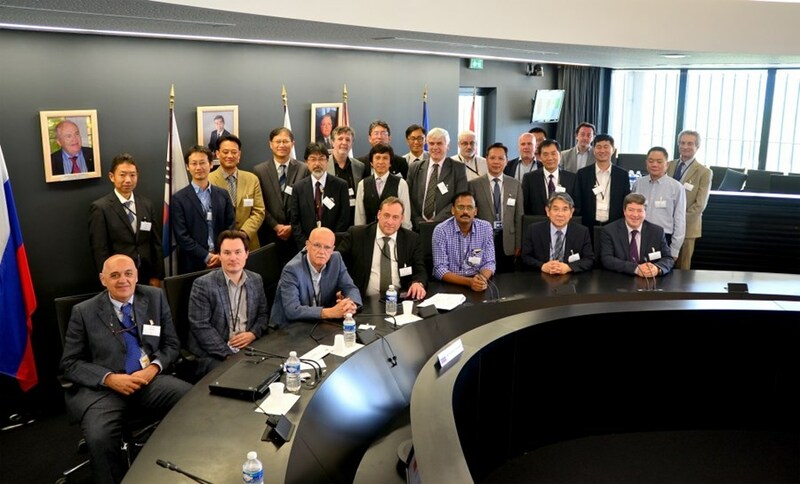 Other important items addressed during the three days were the integration of TBS operations into the revised ITER research plan accounting for the staged approach of ITER; and the report that has been made on the TBM program safety demonstration and on the management of TBM radwaste. Dedicated working groups are active on both of these important issues (with the participation in the latter of Agence Iter France). Note: A tritium breeding blanket ensuring tritium breeding self-sufficiency is a compulsory element for a demonstration power reactor (DEMO), the next-step after ITER. Although not required for ITER (since ITER will procure tritium from external sources), among the missions set out for ITER it is included in the Project Specification that "ITER should test tritium breeding module concepts that would lead in a future reactor to tritium self-sufficiency, the extraction of high grade heat and electricity production."